Saturday night, BlinkTag co-founder Brendan gave an Ignite talk titled “How to ask your neighbor for a cup of car” at the Automattic Lounge on Pier 38 in San Francisco. WordPress founder Matt Mullenweg was even in the house (although we didn’t notice him there until after the talks). Click here for Brendan’s summary of different car sharing services, smarter parking, and taxi and car services that all enable people to forego the traditional model of car ownership. BlinkTag co-founder Jed ran a session on Sunday on extending GTFS (Google Transit Feed Specification). Three representatives from Google were at the meeting and they were very supportive and able to field a number of questions from developers and representatives of AC Transit and BART. GTFS cannot be everything to every agency – one of its chief selling points is its simplicity and the limited number of attributes necessary to support a credible routing algorithm. While individual agencies are obviously free to use the base spec for their own purposes (run-cutting or printing time tables, for example), Google has an interest in keeping the feed single-purpose and uncluttered. One important new concept that was discussed was the idea of adding a pathways.txt file, which will describe pedestrian routing within a station. Other possible extensions to the feed included additional attribution for routes (ridership, additional mode types) and other ways to describe fare and payment systems. On Saturday, Melissa Jordan of BART and Trucy led a session on how public agencies could use social media to more effectively engage their customers. The presentation centered on what social media tool to use and when, as well as what kinds of content to post and how it should be delivered. Additional discussions touched upon legal and liability issues with interactions that occur via Twitter and Facebook between a public agency and a customer. And Subway Crush SubMate. Research what social media outlets might be most effective for your organization; make sure your message is reaching the right audience. Know your audience. What you think is cool may surprisingly differ from what your audience thinks. Once you start using social media, be careful of how you build and manage your brand. Have fun, and interact with your customers. Information that goes two ways is better than you just pushing information one way. 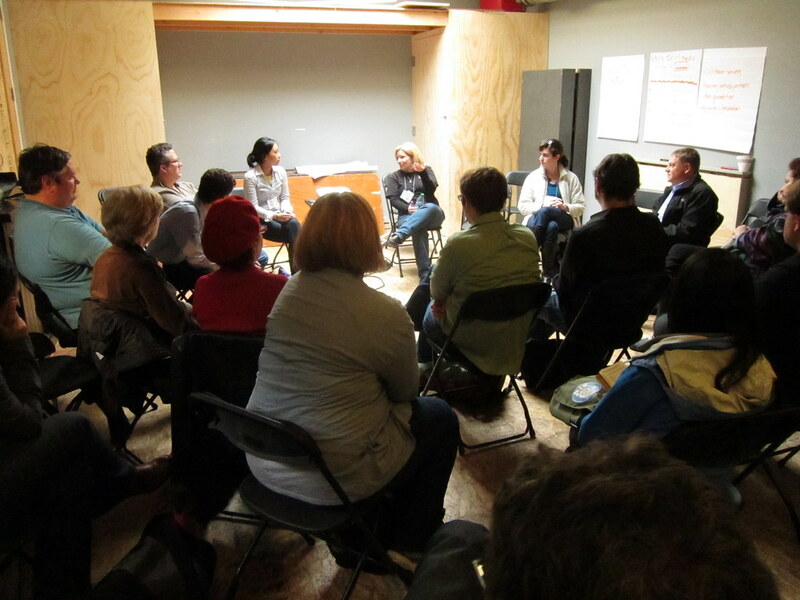 Also on Saturday, Ruth Miller led a discussion on Bay Area Bus Rapid Transit (BRT) projects. Participants discussed common misconceptions about the Van Ness, Geary, and East Bay proposals, and generated a diverse list of implementable strategies to build supportive coalitions and more effectively represent existing supporters. In a followup session on Sunday, Ruth and her Walk Oakland Bike Oakland colleague Danny Snyder joined Ben Kaufman and Rob Boden of the San Francisco Transit Riders Union to bring the transportation advocacy discussion to the regional level.